How Advancement in PCB is Driving Industrial & Instrumentation Automation? - Sierra Assembly Technology Inc.
How Advancement in PCB is Driving Industrial & Instrumentation Automation? Printed Circuit Boards (PCB) are designed to connect various electronic components using conductive pathways or traces. These traces are cut from copper sheets, which are laminated on a non-conductive substrate. Today,many industrial and commercial applications are PCB-driven. Are you eager to know what are they? 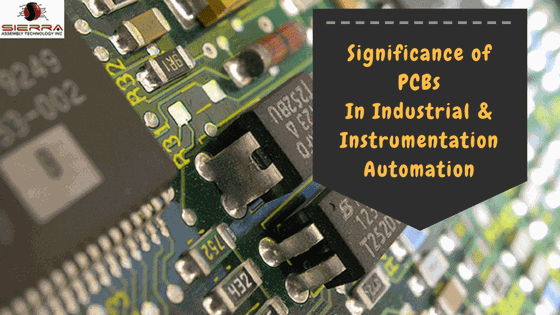 Read this post to know the significance of PCBs in industrial and instrumentation automation. Data Centers: Cloud computing servers are the backbone of data centers. The introduction of PCBs has led to the sharing of I/O devices implemented using cloud servers. Cloud computing servers comprise of various I/O devices, which are interconnected via PCB based applications, such as PCI-e Fabric. This is feasible and less costly in comparison to sharing local I/O devices such as NIC (Network Interface Controllers) or any storage interface. Also, it helps to reduce the cabling options among the I/O devices, which eventually increases the efficiency aspect of the cloud computing servers. This helps in reducing cabling options between nodes, storage, and network. Further, it improves network performance and helps reduce human errors. Smart Home Applications: PCBs are driving smart home applications like wall mounted tablets, computer systems, or sensors. These devices are interconnected through the internet and are used for real-time tracking and monitoring. Also, various applications like LCD displays, mobile screens, and connectivity antennas have brought major changes in the electronic industry, due to the introduction of PCBs. Torque Sensor Systems: PCB embedded Torque enabled sensor systems are used in many aerospace applications, automotive components, and various other demanding areas. Strain gages are special types of sensors fitted inside the transducers, which help convert physical and mechanical forces into electric signals. The resistance of strain gages varies with the force applied. Accelerometers: Various applications such as aircraft gas engines, rocket propulsion systems, and industrial turbines have accelerometers fitted inside them. Advanced PCB sensors fitted inside the accelerometers help resist high-temperature variations, improve noise measurement, and data quality. Proper design and assembly of PCBs have helped in designing various automation enabled systems. If you have any doubts regarding the design and manufacture of PCBs, you can always consult an industry expert like Sierra Assembly Technology Inc. The company has Manufactured and delivered customized PCBs for various industrial and instrumentation automation applications.